Football lovers in Kashmir had lots to cheer about on Tuesday when the valley hosted its first ever I-League game and hundreds of fans, including former chief minister Omar Abdullah, turned up to root for the local team -- Real Kashmir FC. As clouds made way for the sun after four days of overcast weather, the fans descended on the valley's lone football stadium the Astroturf TRC ground here in the summer capital of the state. Overlooked by snow-capped mountains and fiery Chinar trees, the TRC ground came to life as the match between Real Kashmir FC and Churchill Brothers SC which ended in a 0-0 draw. The opportunity to watch top-level football players along with the enthusiasm to support the home team drew people from the city and other districts of the valley to witness the game. Slowly, every seat in the stadium was filled and many fans were not able to find a spot for themselves. While the crowd welcomed both the teams with a loud applause, the stadium reverberated with slogans favouring the home team. Young and old alike cheered for them and enjoyed every bit of the game. The boisterous home crowd was behind its team on its every move but felt disappointed when the team could not convert the chances into goals. "This match is very exciting for several reasons. First, it is the first time that a match of such a prestigious league is being played here. Second, it is our own team which is playing," Shabir Ahmad, a football enthusiast, said. "Then, we are getting a chance to see quality football with players from across the country and even abroad," he added. Ahmad, however, said he felt disappointed that the team could not score. "They had good chances but could not convert them into goals. We felt a bit disappointed, but overall, they played really well and we had a good game to watch," he said. Another spectator, Mansoor Bhat, a resident of downtown here, said such matches would build interest in football and would go a long way in popularising the game. 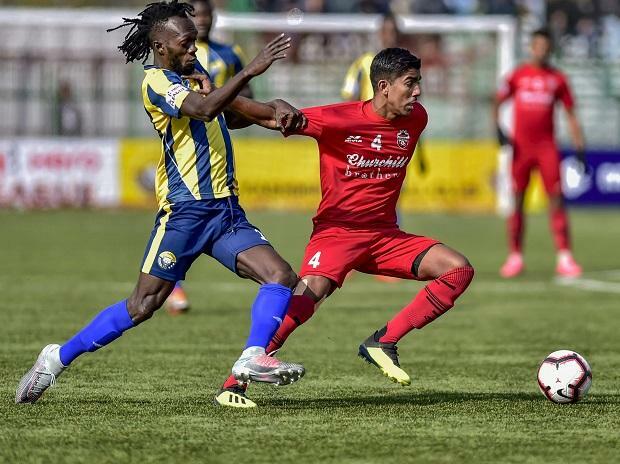 "The youth in Kashmir is generally fond of football, but games like this will attract more of them to the sport and I am sure many of them will now think about it seriously," Bhat said. Real Kashmir FC Striker Danish Farooq also expressed hope that many youth would choose football as their future. "More youth will associate themselves with the game now. I think and I am hopeful that they will now see that there is future in football," he said at the post-match press conference. Farooq said it was a proud moment for the team to play at home. "We were very excited, but kept our focus though we did not put up a good result, we did well. It was a proud moment for all of us and we will not disappoint our fans the next time," he said after being declared man of the match.